So a big series is in the books for Auburn. What did we learn? A little bit more about the Tigers make up come SEC season (which is just 2 weeks away). -Auburn has power. Auburn has hit 17 HRs already this year and it's coming from all over. SS Casey McElroy is the only everyday player without at least 1 HR. Joseph Sanders leads the team with 5. -Joseph Sanders and Trent Mummey are a potent one two punch at the top of the order. Over the weekend they went a combined 12 for 25 (.480) in the three game series. -Auburn still has some lineup holes. After Sanders and Mummey (and occasionally Ben Jones who had a decent weekend), Auburn has problems. That was more than evident in this weekends games. Let's look at batting positions 4-9 over three game set. -McElroy, a Freshman, has seen his average drop to a cool .125. In 7 games, he's only managed 3 hits. He normally bats in slot 7 and seems to be a little impatient at the plate, normally swinging at the first pitch. -Kevin Patterson also needs a bit of work. Normally DH (or 1B when Hunter Morris is hurt/resting) he's already struck out 10 times in 24 ABs. -But, on the bright side, this is the #5 team in the country and, ignoring Friday's debacle, Auburn was in step and managed to steal a game, despite some glaring weaknesses. -Jon Luke Jacobs seems ready now. CJP pushed him to his limit Saturday. Keeping him in through the 5th inning and over 100 pitches. -Tony Caldwell seems to have won the starting C spot. He started all 3 games over the weekend. Oh and before I forget. 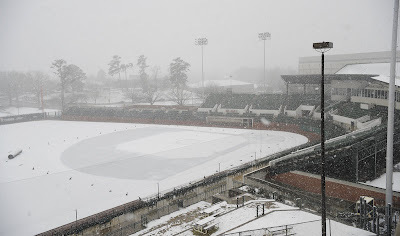 Winning that game on Saturday must have upset the Baseball Gods, because rise and shine Sunday morning and Plainsman Park had more white powder than a Miami nightclub. Yes. Sunday's game was "snowed out". Recap 3/17: What the Buc?